The Daily stillness provides an ongoing practice embedded in your everyday to help you learn about the many ways in which stillness is more than silence or slowing your life down. If we were forced to say it is about only one thing, then we would say it is attention training. These exercises are designed to embed in your day and will not take longer than 30 minutes to complete. Of course, they can be done as many times in a day as you feel you need to rebalance a busy day with a different rhythm. Patricia Berry talks about stopping as a mode of animation to embody the idea of movement within stasis and vice versa. This video gives you an example of what this might mean. 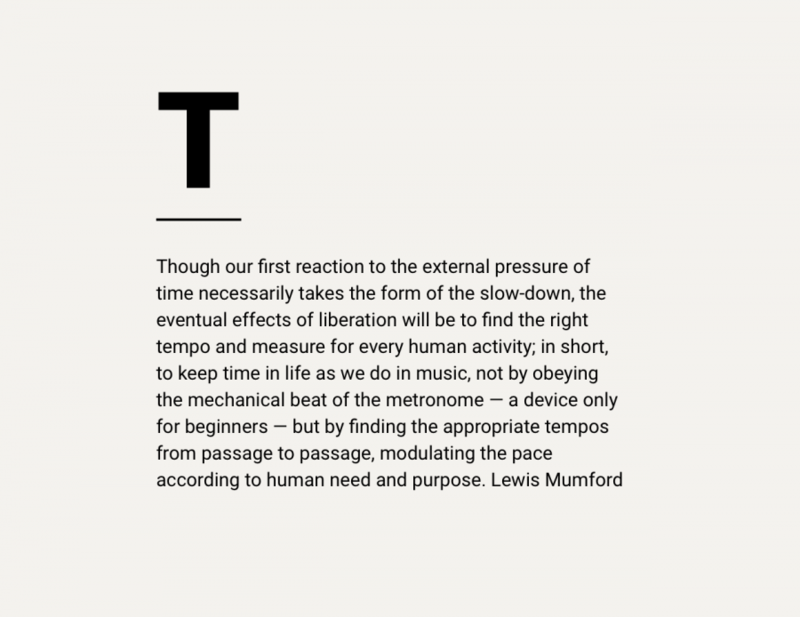 We may play the same notes in the same sequence, but there is always that question of tempo [and] it depends upon the person, the task and the setting. A reason why, often, well intended advise about work-life balance cannot be made a reality in the complex system that is our life. seize the controls of your life! There are no registrations, no prizes, just people practicing to gain a little more awareness of habitual patterns every day. Follow us on Twitter @livedtime or Subscribe to The Daily Stillness by Email. A new practice will be posted each day and you can always click on random to get a different practice if the one for the day does not suit you. We encourage you to do the ones that you least want to do, though. These are the ones that are likely to teach you the most about personal obstacles to finding stillness in motion.